Reading and writing to any contactless HID iCLASS card, the device economically supports desktop clients where contactless iCLASS technology is used. 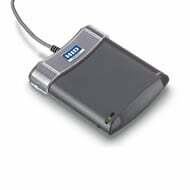 The HID OMNIKEY 5321 CLi USB series readers were designed to work seamlessly with iCLASS-enabled logical access applications in combination with naviGO, a cost-effective solution that simplifies deployment of strong authentication, managing and automating the lifecycle of strong authentication user credentials on iCLASS smart cards. Designed to enable HID on the Desktop applications, naviGO allows card holders to manage their own enrollment, PIN management and knowledge-based authentication through a self-service browser based application. The HID R53210039-1 is also known as HID-R532100391	or R532100391	.